If you're looking for a way to switch up your chicken dinners, this Baked Lemon Parmesan Chicken will not disappoint you! 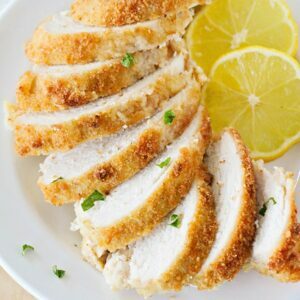 Chicken breasts breaded in a parmesan crust, with the perfect hint of lemon, and oven baked to perfection - crispy on the outside, tender on the inside! Trim the chicken and cut into serving-size pieces. In a medium bowl, whisk together the egg and lemon juice. Place the chicken pieces in the egg mixture, cover, and refrigerate thirty minutes. Preheat the oven to 400. Line a baking sheet with parchment or foil and set aside. In a shallow dish, whisk together the bread crumbs, parmesan, lemon zest, garlic powder, salt, and pepper. Dip the chicken pieces into the bread crumbs, coating both sides. Place on the prepared baking sheet and spray with cooking spray. Bake 15 minutes, flip, and bake an additional 10 minutes, until crispy and golden brown. Serve with fresh lemon slices.